A Rotom has made residence in your smartphone! 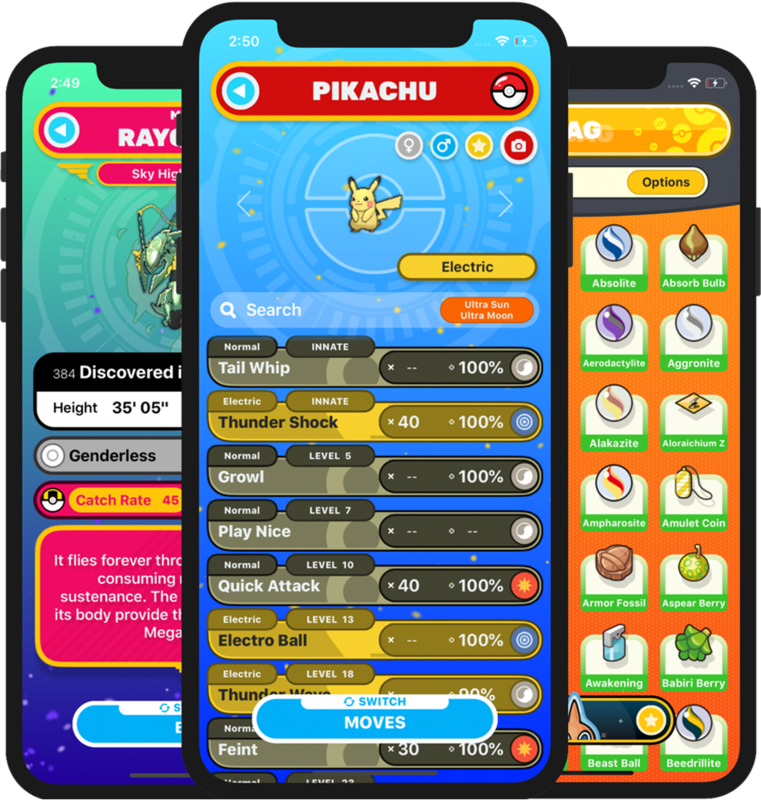 RotoGO is an Unofficial Pokémon Index (Pokédex) app inspired by the popular video game franchise Pokémon. Based on the Pokédex used by the player character in the latest series handheld video games, RotoGO is a real world Pokédex similar to the ones used in the anime series and graphic novels. A valuable supplement for any Pokémon player, competitive or casual! Detailed analysis of all 807 Pokémon and their alternate forms and transformations, including preforms and evolution methods, base stats, egg groups, typings, abilities and more! Store your Pokémon in your PC. If you're a collector, keep track of all of your Pokémon, or save your favorites into your Battle Boxes! The damage chart provides detailed info for every type and type combinations strengths, resistances, weaknesses, and immunities! Sift around your trainer bag and see what you can find! Evolution items, battle items, EV training items and more! Comprehensive info on every single Pokémon move available throughout the main series. See the effects that natures have on your Pokémon in addition to recommended lists of Pokémon that each nature would best complement! Ability data for every single Pokémon including hidden abilities and exclusive abilities! Unlock themes to personalize your Pokédex. 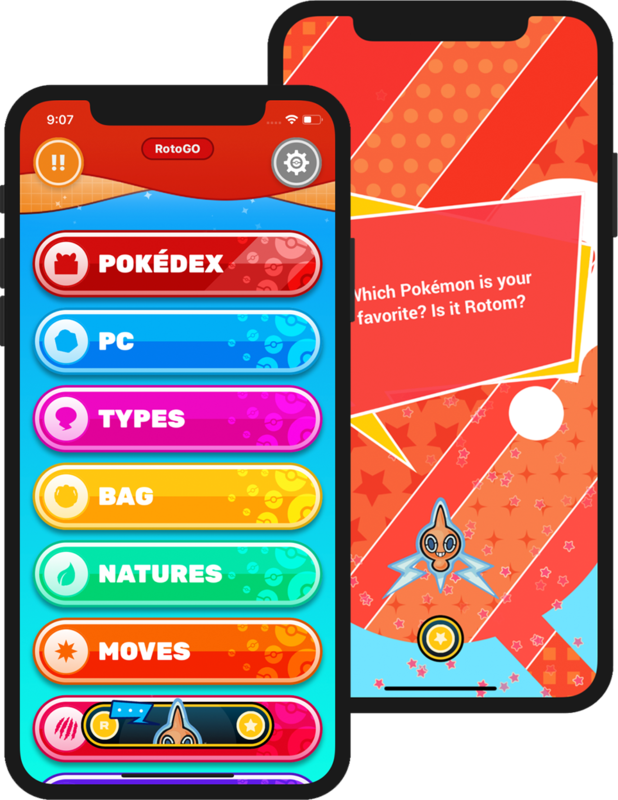 Each themes comes with unique outfits for Rotom in addition to app wide aesthetic changes! "I've downloaded nearly every single Pokedex app on the market and have had many differing opinions about each. This app however, completely blows the rest out of the water. It delivers everything you would need in a Pokedex, and way more." "RotoGo is by far the best PokéDex app out there. It is intuitive, well designed, and intricate. It’s also surprisingly charming too! It’s amazing! I love it! And the customizable in app purchases are great for making it feel unique to me. RotoGo is more than worth the 5 bucks. This is a must buy for anyone looking for a PokéDex on the market. I see the passion and love in this app." "I've downloaded nearly every Poke Dex app out there, and RotoGo is the best bar none. It has an awesome slick design complete with a talking Rotom and background music (don't worry, you can toggle it off)." Pokémon is the intelectual property of Nintendo Co., Ltd., Creatures Inc, and GAME FREAK Inc. This app is intended to act a companion app for Pokémon players, and is in no way intended to infringe on said copyrighted material.